-So what is Enterprise Edition? -What are these premium features you’ve mentioned? -Is there a fee for the PowerSchool integration? -Do you have more information on this PowerSchool Integration? -Who is Enterprise Edition for? -How much is Enterprise Edition? -How can I get my school district to go Enterprise? Interested in Piloting our system? Please fill out the form below, and we'll contact you. Feel free to tell us what you're interested in. So what is Enterprise Edition? How is it different from Standard Edition? Glad you asked! Whereas the Standard Edition is reserved for a school to purchase for themselves, Enterprise Edition is purchased by the school district and connects all the schools to one easy-to-manage account. In addition, Enterprise has premium features only available for district customers. What are these premium features you’ve mentioned? Enterprise customers can enjoy district-wide reporting, NoGo lists, preloaded users, and enhanced NoGo lists! 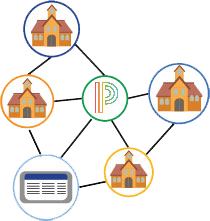 We also pride ourselves on being the only visitor management system that has a real-time connection to PowerSchool. This means that when a student tardy or early release is recorded with our system, it goes right back to PowerSchool. Automatically! There are integrations for iNow and Verified Volunteers currently in the works as well! For a complete breakdown, check out our feature comparison chart. Is there a fee for the PowerSchool integration? Yes. There is a one-time fee of $500 for setting up the API for the integrations we have. To connect your student lists it is $.50 per student. For example, a district with 1,200 students would be charged $500 for the setup, plus $600 for the student list connection. Do you have more information on this PowerSchool Integration? Yes! We have a whole page dedicated just to our integration. Feel free to check it out here. Who is Enterprise Edition for? Enterprise Edition can be purchased by school districts. Individual school sites can only purchase an Enterprise license on their own if they are not connected to a school district. How much is Enterprise Edition? Districts can purchase Enterprise for $420 per school for a one year license. Each school needs to have their own license to be connected to the district account. Quotes can only be provided by the national office, not by local representatives. How can I get my school district to go Enterprise? Give us a call or send an email, we’d love to talk! Contact the Ident-A-Kid National Office today by calling 800-890-1000 option 4 or email sales@identakid.com. Credit cards, checks and purchase orders are accepted as payments. View all Payment Options here.